Pictured L-R: Neil Crilly, West Regional Director, Member Services, The Recording Academy®; Alex Da Kid, producer/songwriter/label head and event panelist; Maureen Droney, Managing Director, Producers & Engineers Wing; Daryl Friedman, Chief Advocacy and Industry Relations Officer, The Recording Academy (also panel moderator); Christine Albert, National Chair, The Recording Academy; John Alagia, musician/songwriter/producer and event panelist; and Ray Benson, producer/musician and event panelist. Photograph courtesy of The Recording Academy®. © 2015. 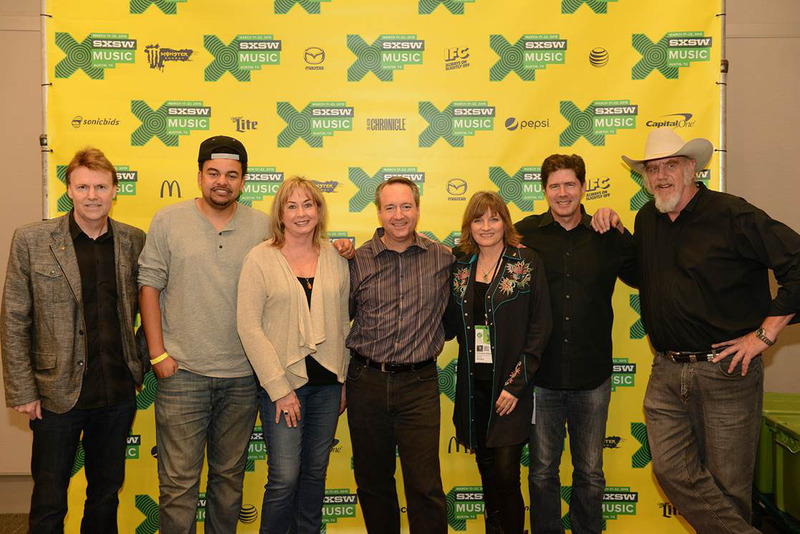 Santa Monica, Calif. (April 23, 2015) — At the 2015 South By Southwest conference in Austin, Texas, The Recording Academy®, along with its Texas Chapter and the Producers & Engineers Wing®, had a strong presence as a host and advocate for important industry issues with an all-star panel. The Recording Academy’s Chief Advocacy and Industry Relations Officer Daryl Friedman led the panel, which comprised producer, songwriter and label head Alex Da Kid (Imagine Dragons, Rihanna, Eminem), Austin hometown hero Ray Benson (Asleep at the Wheel, Willie Nelson, Trace Adkins) and musician, songwriter and producer John Alagia (John Mayer, Dave Matthews, Rachael Yamagata). The panel spanned topics ranging from songwriting and recording styles to tricks of the trade for getting the best out of artists. A high point of the panel was the playback of both a demo and the final version of a song by each producer. But the real highlight of the panel was the announcement made by Friedman to the cheering audience regarding the introduction of the Allocation for Music Producers (AMP) Act, which specifically addresses digital performance royalties for studio professionals and will ensure fast, accurate and direct payment to those with letters of direction, along with a mechanism to receive royalties for works created prior to the Digital Performance Rights Act of 1995. After a brief explanation of the bill, Friedman called a time out and proceeded to lead the audience through the simple process of using their phones to send a letter to their local members of Congress supporting the Act. The letter can be read here: https://www.grammypro.com/advocacy-action#. "South By Southwest remains one of the prime settings for music industry brainstorming sessions," stated P&E Wing Managing Director Maureen Droney. "We feel fortunate to have a forum there for producers and engineers to share their knowledge and experience and to advocate for the AMP Act, which brings to the forefront important issues regarding fair compensation for music creators who work behind the scenes." Photo Caption: Pictured L-R: Neil Crilly, West Regional Director, Member Services, The Recording Academy®; Alex Da Kid, producer/songwriter/label head and event panelist; Maureen Droney, Managing Director, Producers & Engineers Wing; Daryl Friedman, Chief Advocacy and Industry Relations Officer, The Recording Academy (also panel moderator); Christine Albert, National Chair, The Recording Academy; John Alagia, musician/songwriter/producer and event panelist; and Ray Benson, producer/musician and event panelist. Photograph courtesy of The Recording Academy®. © 2015.